PUC McArthur Stadium played host to the first of 5 PUMA School of Speed Meets in 2018 at the weekend with high school athletes taking to the track to stretch their legs and display their talents under the watchful eye of the school’s Vice Principal and 100m sensation Thando Roto. U15 Girls, Amone Nel in 90m hurdles [13.71) a PUMA invitational athlete who hopes to qualify for National Champs in September later this year. The series of track meets is endorsed by athletics federations, so these outstanding performances count towards qualification for provincial and national championships. 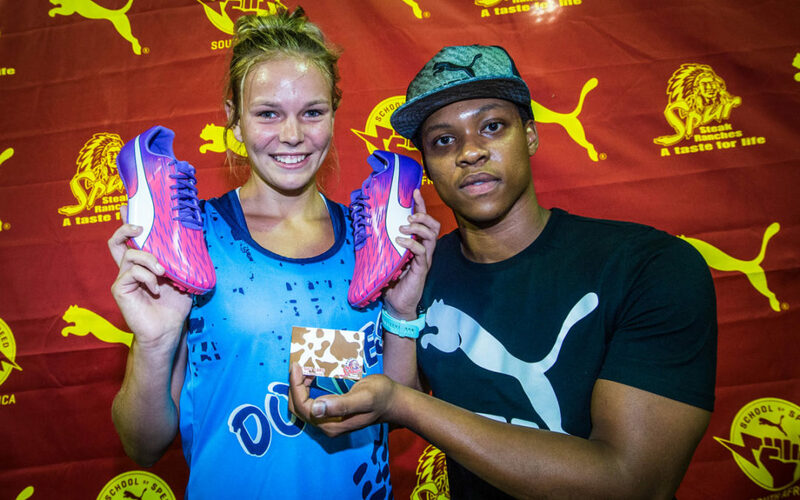 PUMA Marketing Director Brett Bellinger says PUMA has produced some incredible talent over the past few years and he is in no doubt that the 2018 Series will further boost junior athletics in South Africa. “Well done to every single athlete brave enough to take to the track, and to all the supporters for cheering them on. We hope to see just as much excitement around race day in Johannesburg next week,” says Bellinger. The PUMA School of Speed, which puts the spotlight on sprint distances as well as the short hurdles, long jump and high jump, is presented by global sports brand PUMA and event specialists Stillwater Sports, along with sponsors Spur to uncover the next Usain Bolt, who is also the PUMA School of Speed’s Principal. The 2018 series will continue on to Ruimsig Athletics Stadium, Johannesburg on Monday January 29, Kings Park Stadium, Durban on Saturday February 10, Dal Josafat, Paarl on Monday February 26 and Bestmed Tuks Stadium, Pretoria on Saturday March 3 all to be attended by the School of Speed Vice Principal and PUMA Ambassador, Thando Roto. Results of the latest meet can be found at www.schoolofspeed.com. Join the #ForeverFaster hall of fame. Are you in…? Follow us on Facebook: School of Speed South Africa & Instagram: @schoolofspeed to keep up to speed on all the latest news via email info@schoolofspeed.com or visit www.schoolofspeed.com for race info and kim@splashpr.co.za for media enquiries.